Judgment preconstructed decks contain 60 cards, a strategy insert, and a premium Odyssey land card. Released in 2002, Judgment is the third set in the Odyssey block. The set contains 143 black-bordered cards (44 rare, 44 uncommon, and 55 commons).This is the second expansion set made that did not have an equal number cards from each color. The first expansion with such an imbalance was its predecessor, the Torment expansion set, which was skewed towards the color black. 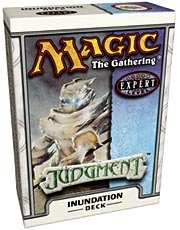 The Judgment expansion set was meant to balance this, and skews towards green and white, black's enemy colors. The expansion symbol for Judgment was a scale. There are 16 black cards, 33 green and white, 27 red and blue, 3 nonbasic lands, and 4 multicolored cards. All multicolored cards in the set are both green and white. With Jeska mortally wounded by his own sword, Kamahl leaves his sister to the care of his centaur friend Seton, setting out on a quest to find a way to heal her. Her wound festers from the might of the Mirari, currently fixed to the pommel of Kamahl's sword. Meanwhile, Laquatus schemes as much as ever to persuade Empress Llawan to aid him in finding the Mirari. Along with his bodyguard Burke (Laquatus' Champion), the ever-demented Braids, and Commander Eesha of the Aven, each plays a part in the war over the Mirari. Kamahl trains with the Nantuko Thriss in Krosa in Druidic magic and ultimately confronts Laquatus in a showdown. Upon victory, Kamahl slams his sword into the ground, granting his wish and bringing life and growth to the surrounding environment (Mirari's Wake), though he unfortunately cannot cure his dying sister's wound. Wishes - a cycle of cards that allow the player to bring in cards that they own from outside the game. Burning, Cunning, Death, Golden, Living Wish. Incarnations - a cycle of cards that granted abilities to creatures in play as long as they were in the graveyard. Anger, Brawn, Filth, Genesis, Glory, Valor, Wonder. Phantoms - spirits that are semi-invulnerable. They come into play with a certain number of +1/+1 counters, and instead of taking damage, have one counter removed (But cards that gave a phantom a toughness boost or a +1/+1 counter, allowed them to stay around as long as the effect is active on the creature. e.g Mirari's Wake and Elephant Guide ). The Phantoms; Flock, Nantuko, Nishoba, Nomad, and Tiger. Incidentally, this ability also works well with the "Graft" mechanic, introduced in Dissension. With the release of Judgment, the Wishes (specifically Burning, Cunning and Living Wish) offered a radical new approach to deckbuilding in tournament play. Control decks and Combo Decks across multiple formats revolutionized themselves with the method of devoting sideboard space for combo pieces and silver bullets. In essence, this made the maindeck stronger but the smaller sideboard made postboard games weaker. Burning Wish received DCI attention after it was showcased in an absurdly powerful Vintage deck called "Long.dec" where multiple Burning Wishes were used to abuse a single Yawgmoth's Will in the sideboard, the deck would then traditionally win using Tendrills of Agony (which could also be searched up using Burning Wish). This tournament-legal combo deck boasted an incredible 60% 1st Turn Kill rate, making it one of the most powerful Magic decks ever. Burning Wish was thus restricted in Vintage by the DCI on December 1, 2003, making it a good candidate for the most powerful card in Judgment.